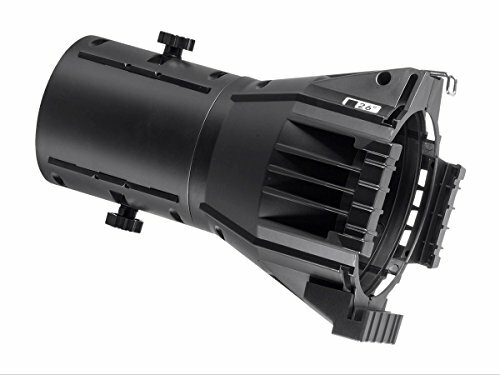 Performance grade ABS housing and optics ensure this interchangeable ellipsoidal lens tube will reduce truss loads and make adjustments faster and easier. Fully compatible with most ERS (Ellipsoidal reflector spotlight) fixtures, you can safely use this lens tube with ETC, Chauvet, and other major brand LED stage lights. Get more out of your ellipsoidal stage lighting by purchasing multiple interchangeable lens tubes to fit the various shows and performances you do every year. Available in 10-, 19-, 26-, 36-, and 50-degree options, Stage Right has a lens tube for any need and any room. Enjoy "No Tool" convenience while switching these lenses. Simply unscrew the top and bottom wingnuts on the barrel and change to the required lens. Available in 10, 19, 26, 36, & 50 degree options Stage Right has a lens tube for any need and any room. Enjoy "No Tool" convenience while switching these lenses. Simply unscrew the top and bottom wingnuts on the barrel and change to the required lens. Buy with confidence thanks to our 30-day money-back guarantee and 1 year warrany.